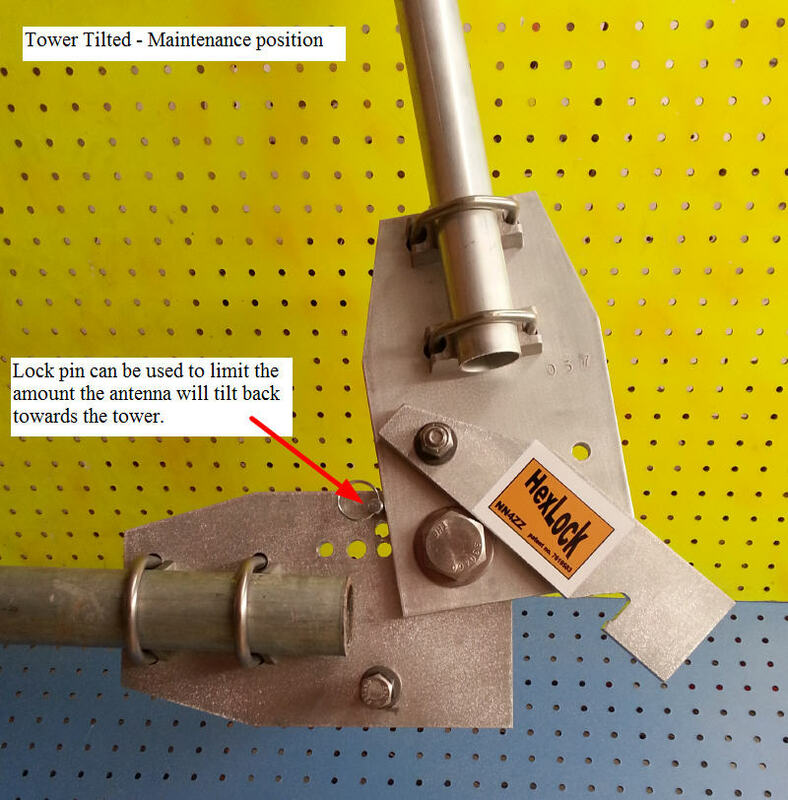 What is a HexLock - The HexLock is a device that will let you tilt your tower all the way to the ground to work on your HexBeam type antenna, rotator, or tower. It works by letting the Hexbeam swivel up and out of the way as the tower is lowered. When the tower is in the operational position the antenna is locked into position. 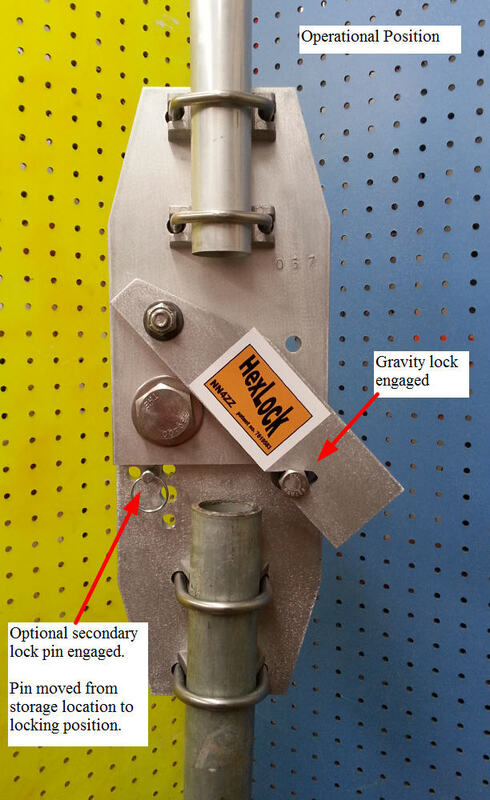 The locking mechanism is powered by gravity. 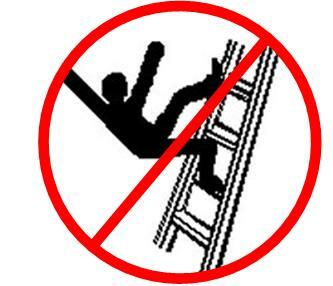 No more climbing to work on any part of your antenna, tower or rotator. Tiltover Tower -- Here is a Groups.io forum dedicated to crankup and tiltover tower users. You may be interested in joining. Shipping is to continental U.S. and varies by UPS zone. For shipping to Alaska, Hawaii, Canada and International, contact me for current rates. The package is 9 X 9 X 21 inches and weighs about 12 lbs. Optional secondary pin lock may be used as shown or the pin can be left in the storage position out of the way. 2 " tower mast at the bottom. When the tower is tilted the HexLock swings out and unlocks the plates. When the tower is raised this action is reversed. 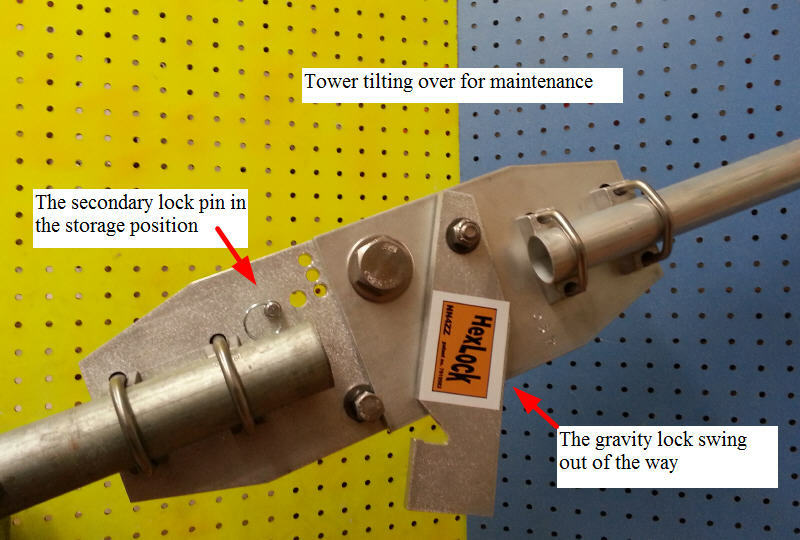 The plates are held in position by gravity and when the tower is raised to about 60 degrees, the HexLock engages to prevent any movement when the tower reaches the operational position. The secondary pin lock can be used also for additional high wind conditions if desired. When the tower is tilted over to the point where you can reach the hexbeam, you lift it and begin to tilt it back toward horizontal. As the tower continues to come down, continue to lift the hexbeam until it is completely horizontal. It helps to have a second person at this stage, one to lower the tower and one to lift the hexbeam. The tower is now parallel to the ground and the antenna is rotated up and fully accessible. All parts of the tower and rotator are near chest level. The antenna can be tilted beyond 90 degrees and rested on the tower. 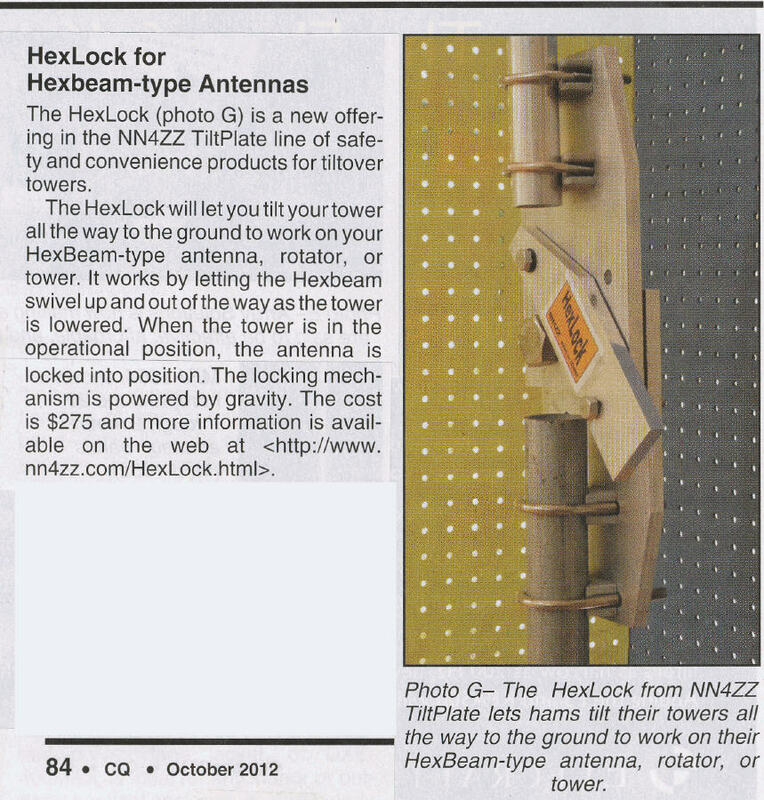 Or the lock pin can be used to limit how far the antenna tilts back toward the tower. Some use a bungee or rope to help hold it in place. Q - What type of towers and rotators are supported? Q - What were the design considerations for the HexLock? A - The hardware is stainless steel to withstand years of exposure to the elements. 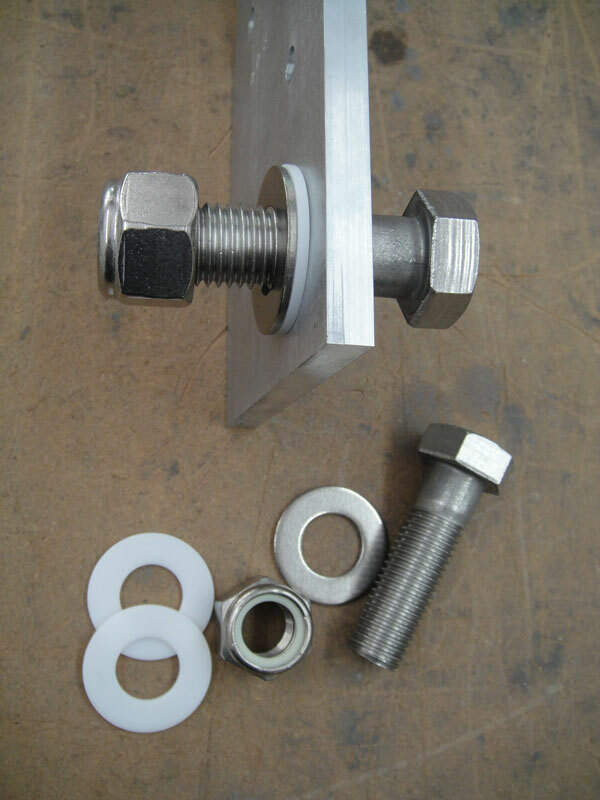 The HexLock uses high quality U-bolts from DX Engineering. The plates are 6061 aluminum and machined on a CNC. The pivot bearing uses an oversize 1" diameter stainless steel shaft since the lateral forces on the bearing are quite high at the 100 MPH high wind rating. The plates are 1/2 inch thick for strength. Q - What is the purpose of the locking pin? A - The Locking pin is a new feature added in February 2015. The locking pin serves two purposes, both are optional. It can be used to provide additional positive locking for very heavy wind conditions. 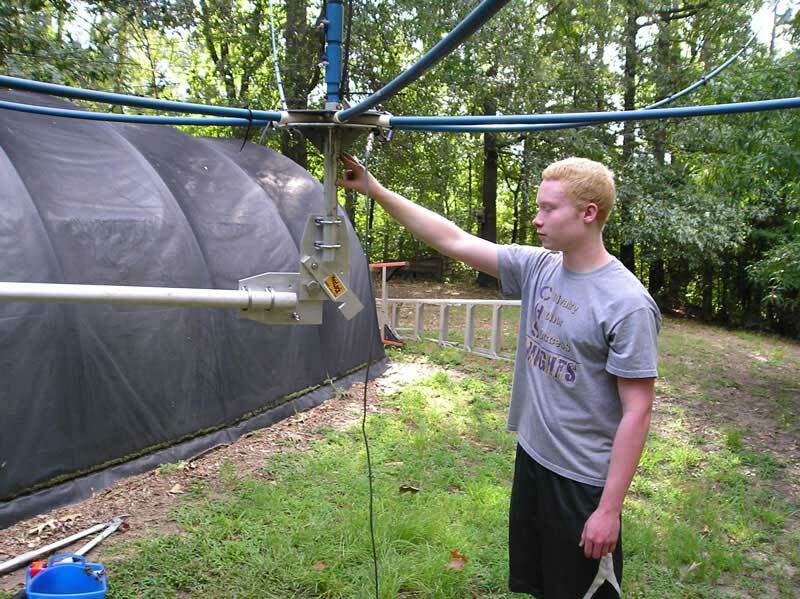 It can be used to limit the amount the antenna tilts back toward the tower when in the maintenance position. If not needed it can be left in the storage location out of the way. If you have the original HexLock and would like to add the locking pin, we'll mail one to you for free. Send email to request one. You will just need to drill the 3/8 inch holes with a portable drill. Drill at least one hole in any of the 3 locking locations. Drill the hole about 1/16 to 1/8 of an inch below the front plate to allow clearance for the retaining ring. It is not necessary to drill all 3 holes as shown. 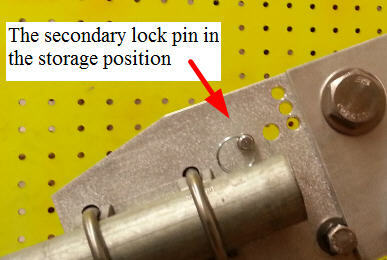 If you would like to store the pin on the HexLock you can also drill a hole in the storage position. If you have one of the really large and heavy hexbeams like the RadioWavz Semtinel that covers 160M-10M there are some additional options to insure the lock stays locked in heavy winds, etc. One of the easy options is to add a 1/2 SS bolt ( 2" or 2 1/4" is fine) that holds the swinding lock from lifting. Example below. Q - What is the size and weight of the HexLock? A - The HexLock weighs about 10 lbs and it is 17" x 6". Q - What type of pivot bearing is used and what is the load rating? A - There are two Acetal (or Rulon) bearings on a 1 inch diameter stainless steel shaft. They are rated for 1,000 lbs which is well beyond the weight of the antennas supported. 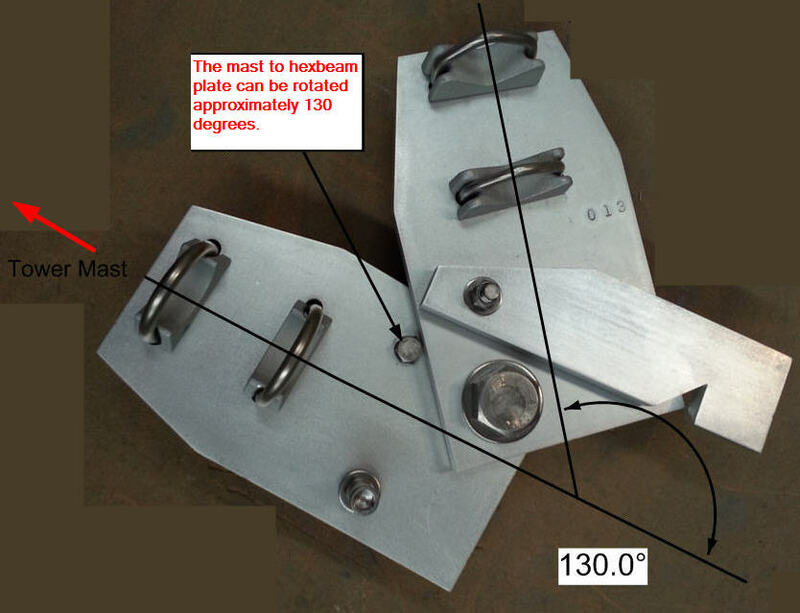 The plates are a full 1/2 inch thick to provide a strong and solid bearing surface. 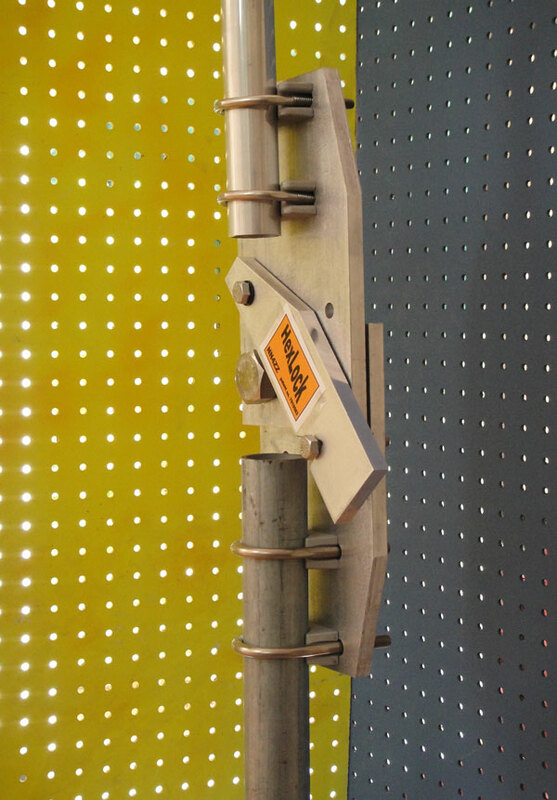 A - No maintenance is required, the HexLock is assembled using all stainless steel hardware and maintenance free bearings. All of the stainless steel hardware is coated with "never-seize" to prevent galling. Q - Do I need to change the V-Bolts for the antenna mast if I want to use a different size mast? 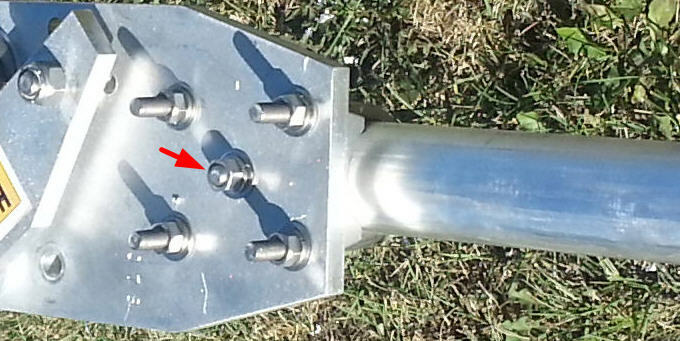 A - No, the V-Bolts accept antenna masts from 1 inch to 2 inches in diameter. 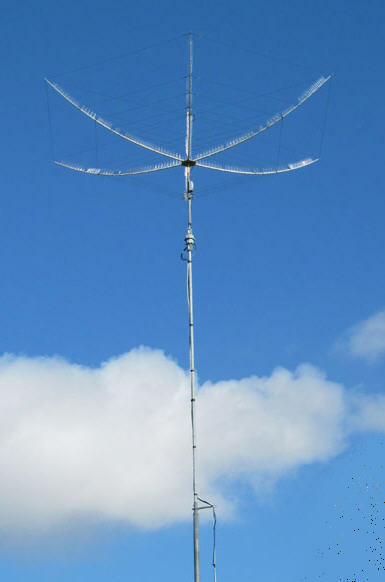 Many of the HexBeam type antennas use non-standard masts sizes including 1.25 inches, 1,75 inches, 1.9 inches. All of the U-Bolt & V-Bolt hardware is from DX Engineering. Q - My main tower mast is less than 2 inches, can I use the V-Bolts for the main mast also? 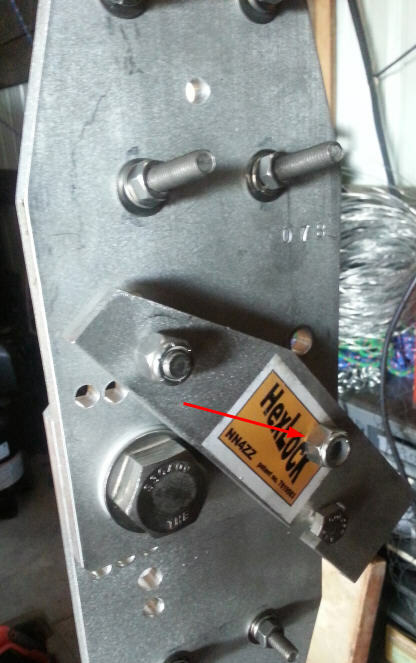 A - Yes, if the main tower mast up to the HexLock is 1.75 inches to 2 inches, the 2" U-bolts are preferred. 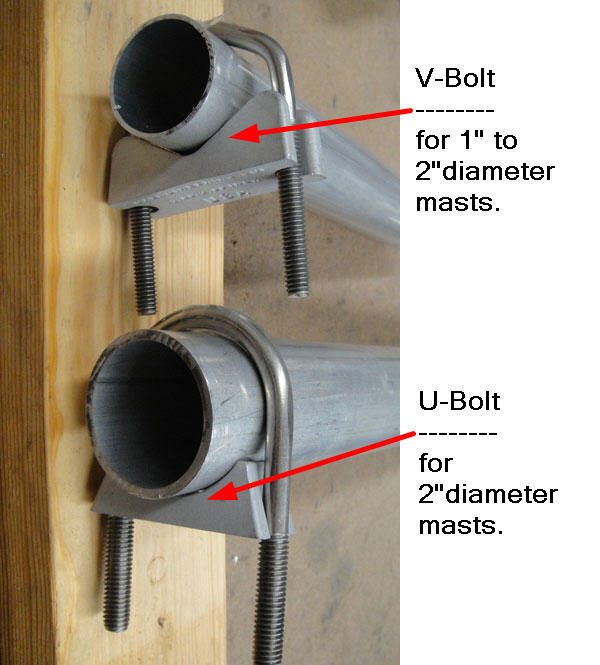 However if you use a smaller main mast, I can supply the V-Bolts for both the tower mast and antenna mast. Q - Are there installation instructions? A - Installations will vary depending on the type of tower, antenna, and user preference for rotator location and mast length. Rather than specific instructions, here are some general guidelines. 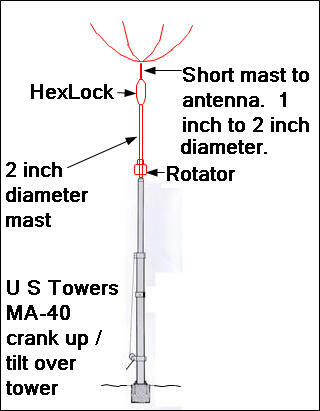 The diagram below shows an installation with a U.S Towers tubular crank up / tilt over tower. 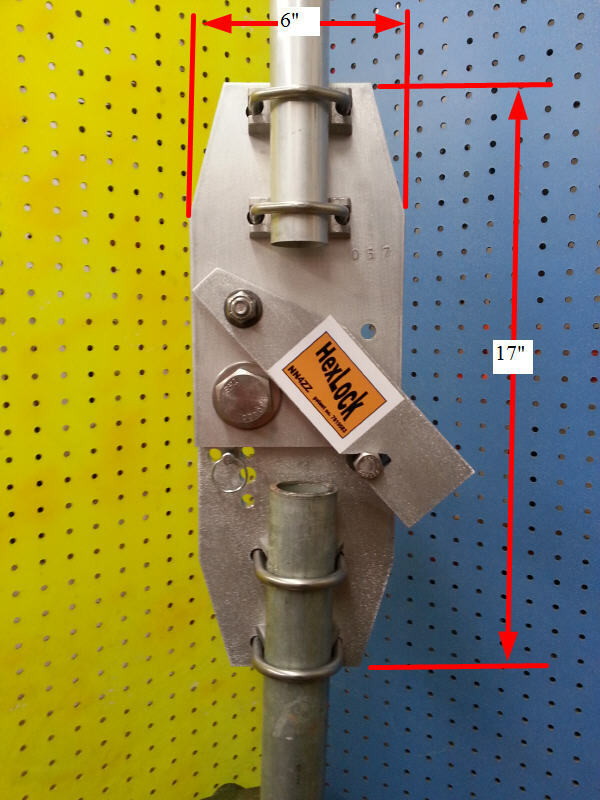 The 2 inch mast between the rotator and bottom of the HexLock is typically 3-15 feet in length. The rotator can be mounted just above the top of the tower (as shown) or there can be a section of mast between the tower and rotator. The mast between the top of the HexLock and the Antenna needs to be short and is typically about 8-12 inches long. This puts the antenna just a few inches above the HexLock. It is important to mount the HexLock just below the antenna so the antenna remains close to the ground when the tower is tilted over in the maintenance position. Also there is some play (about 1/8 inch) in the locking mechanism to insure it engages and disengages properly. Keeping the antenna close to the HexLock also keeps the antenna as level as possible due to the play. 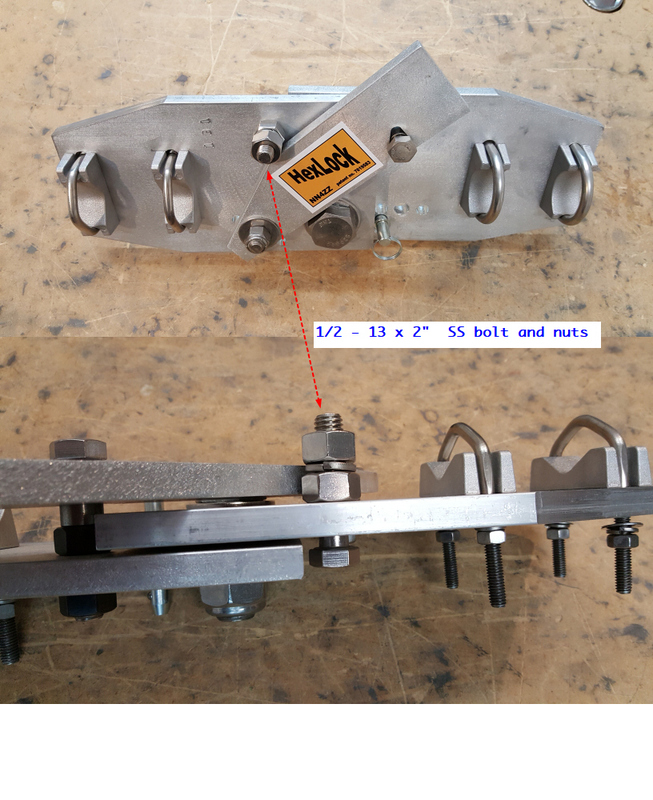 Tip - after mounting the HexLock to the main mast, install the short hexbeam mast and align it before tightening the upper V-bolts. Since there is some play in the HexLock you may find that setting the upper mast to be slightly lower than shown in the picture below will split the difference and keep the antenna more level in the operational position. There is some play in the upper V-bolt holes to allow this adjustment. If you use a longer upper mast (e.g. 2-3 feet ) this is more important as any offset will be amplified. Q - Will the Hexlock allow me to tilt my tower beyond horizontal (i.e. 90 degrees) ? A - Yes, some towers pivot more than 90 degrees and the HexLock will accommodate it per the diagram below. Q - Is there any problem with the masts rotating or slipping in the U-bolts / V-bolts? A - The hexbeams with their circular design don't have the same twisting motion as a yagi. And often large yagis are only attached to the mast with 2 u-bolts. There is less of a slippage concern on the Hexbeam / HexLock and there have been no reports of any slippage on the HexLocks. However if you experience very high winds and would like to pin the masts, that is an option. After installing the masts and getting the alignment correct, you can drill through the mast between the u-bolts and through the plate. Use a 1/4 or 3/8 inch bolt that is 4 inches long. A - The payment process is handled thru PayPal but you don't need to have a paypal account. For International orders I'll send you an invoice that includes the shipping cost. Either way, you can use your credit card or PayPal account (if you have one). Your credit card information is NOT provided to me from PayPal. Q - How will my HexLock be shipped? A - The HexLock will be securely bubble wrapped, boxed and shipped via UPS domestically. The box is 9 X 9 X 21 inches and weighs about 12 lbs. You will receive an email with your tracking number and can expect delivery in 3-5 days in the lower 48 states. A - International shipping rates vary considerably (usually around $50 to $100). Generally USPS Priority mail is least expensive option for Europe and other countries. International delivery is typically 6-10 days. Please email me for the rates to your location. A proforma invoice will be provided to help with customs pickup. Please be sure to include your PHONE NUMBER when ordering as this is needed for the CP-72 USPS customs form. Q - What is the lead time to get a HexLock built? A - I keep the components in stock and will usually assemble and ship your HexLock within 2 days of receiving your order. Delivery is between 3-5 days. Send us your HexLock pictures. They could help someone that has a similar antenna or tower setup. Founded: The LLC was established on October 26, 2009 and is co-owned by Al Ludwick / NN4ZZ and Cal Ludwick. Lida Ludwick (XYL) provides shipping and administrative support. Mission: The mission of our company is to provide safety and convenience products for yagi and quad antenna users with tiltover towers. Our products, the TiltPlate, QuadLock and HexLock are designed to allow antenna maintenance from the ground without the need for a tall ladder or expensive bucket lift. It is our goal to provide the best quality product possible at a reasonable cost. To that end we use the best components, a robust design, and quality manufacturing processes.